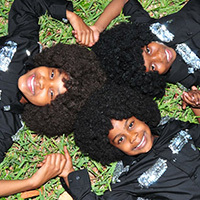 Born in West Palm Beach, FL, The Smith III are the children of Jamaican and American parents. They started to display the love for singing at an early age, with the oldest, Jalyka performing everywhere, modeling and acting. Jalyka's two younger brothers followed in their sister's footsteps, performing for anyone and everyone. Their parents, at first re-focusing the children on academics, eventually decided to support their childrens' obvious gift. In steps Chuck Hemann at Palm Beach Sound Studio, who honed the kids' musicianship. Their voices have grown thanks to their vocal coach, Mrs. Eileen Herzop-Basin. The Smith III are committed, determined, and love what they do. Their debut single, “Put a Stamp On It” dropped in Summer 2012 and was received well enough than the trio recorded their debut album Diamond In A Rock, produced by J-Sharpe. Their success has earned them a featured spot in Billboard Magazine's December 2012 issue, calling the album "inspiring and fun."